As you walk down from the train station in Oxford, you leave behind building works and busy roads only to find yourself surrounded by stone buildings, cobbled streets and cycle paths. 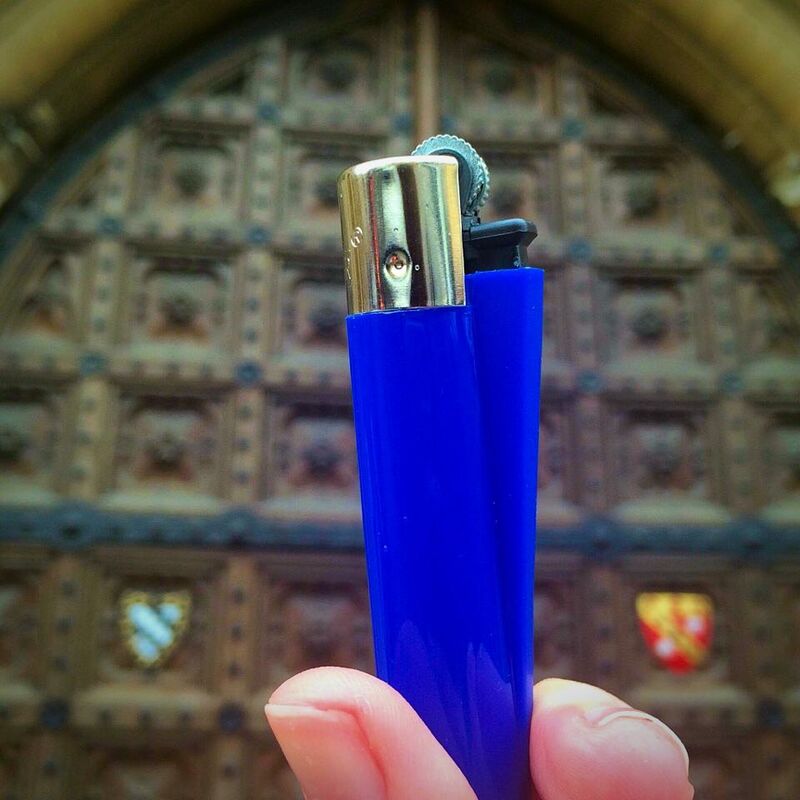 Even in the rain, Oxford is a beautiful city, so I stopped at one of the university’s shops, bought a lighter in Oxford’s colours, and began to light my way through the city. Oxford is a walking city, a cycling city, which means you need body fuel; there’s nothing worse than trekking through a city on an empty stomach, hangry and alone. When you’re in said ravenous, monstrous state – in which you hate everything and just want your morning coffee and a huge pastry and/or toast – it’s really easy to just head for a pub or a Costa (I am very guilty of Costa trips.) But don’t! Seriously, don’t do it. Instead, peel yourself away from familiarity, and treat yourself! There’s an amazing café called George Street Social that will do just that. The bottom is a small café, which is perfect if you want something you can grab and go, but if you work your way to the first floor, there is a library section with a cafeteria. They serve brunch from 9am to 4pm – and it is a brunch that you don’t want to miss, trust me: Everything is freshly cooked, fairly priced and so damn tasty! The Missing Bean is another great place to go. This café is further into the city, but to make up for the distance, they serve some of the best coffee in Oxford, as well as sandwiches and pastries. After eating and waving goodbye to the hangry hunger beast, it’s time to explore. Oxford has a huge collection of museums (most of them owned by the University), each holding their own unique collections. I decided to go to the Pitt Rivers Museum, which was recommended to me by my lovely friend Jen Khatun. When you walk in, the lights are dimmed. In front of you waits a maze of glass and brass cases, filled to the brim with artefacts. A light musty smell greets your nose and as people walk among the collected artefacts, they’ll clink and chatter while the floorboards creak. If you ever go to Pitt Rivers, don’t rush. Take your time. Drink in everything, from the African tribe masks to the shrunken heads on the bottom floor, until your head is sent spinning with ideas and stories. This is what I love most about museums and something you can take away from Oxford as a city. They are able to transport you into world for which we have lost a comprehension for, artefacts and stone buildings staring down at you. As Tiny Ruins puts it, ‘nobody feels old at the museum’ – it’s impossible, as you become submerged in the past. I spent three hours in there before my stomach began to growl again. Wandering over to the only free space, a window table next to five men, I try not to spill my pot of tea. I’m still wet from the rain, fingers freezing and my head throbbing (The door frame to the White Horse is around 5ft 6’’, I’m 5ft 11’’. It was never going to work.) Still, it’s warm inside, and there’s a nice atmosphere to the place. The men at the window are smartly dressed in blazers and comfy looking jumpers and as I near, I realise they’re muttering Italian to each other. As I sit my soup arrives with another pot of tea that I definitely didn’t order. The Italian man shrugs but it’s too late to give it back, the bar man has already walked away. So, I end up with two pots of earl grey, homemade soup and five Italian men. I can’t promise the same will happen to you if you visit the White Horse but I would definitely recommend it, just in case. They do their best to talk to me but I don’t know much Italian so I just listen to their beautiful baritone voices, devouring my soup as they wave their hands around dramatically. An hour later I leave, very warm and very happy. If I had enough money, I would have stayed in Oxford for days. There was still the Bodleian Library to explore, book shops, the channel – had it been sunny – and more museums. I think I’ll be keeping hold of my lighter and revisiting Oxford in the summer because it’s too beautiful a place to ignore. Each nook and cranny leaks history and has the promise of adventure. It’s too hard to stay away from such a place, and I can’t wait to go back.